Our entire organization, all processes from production to the finished product are always oriented to the needs of our customers and are subject to an ongoing optimization process. The quality of our products is constantly subjected to internal and external tests. A separate department is responsible for quality assurance and product development. Vispronet® has been awarded the Trusted Shops seal of quality and thus fulfills the quality criteria in terms of creditworthiness, cost transparency, customer service and data protection. The customers of Vispronet® are therefore offered the integrated purchase protection and the guarantee of Trusted Shops. All processes and production are regularly proved by TÜV. The certification of our quality management system according to DIN EN ISO 9001 is a self-evident matter to us. A flag does not automatically equals quality. Flags from Vispronet® are long-lasting and printed with bright colors. We offer also high quality materials for different applications and budgets. Buying a flag is a matter of trust - quality from Vispronet® is well worth it. 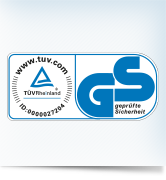 The quality, manufacture and processing of the flagpoles has been certified by the German Technical Inspection Authority (TÜV) and awarded the GS seal.